Twenty-seven rooms displayed on eight floors, all with the sea view, a large restaurant, two lounges, a spa and an infinity pool: these are just some of the details that distinguish the new and luxurious Villa Fraulo, in Ravello; the historic aristocratic residence, which has reopened its doors after three decades of inactivity, in the heart of the city of music. The ex "Panoramica", founded by Pantaleone Fraulo in 1955, which during the American occupation of 1943 was requisitioned and used as housing for Allied officers returning from Cassino, had its activity ceased in 1972, with a sporadic reopening in the years 1980-82. 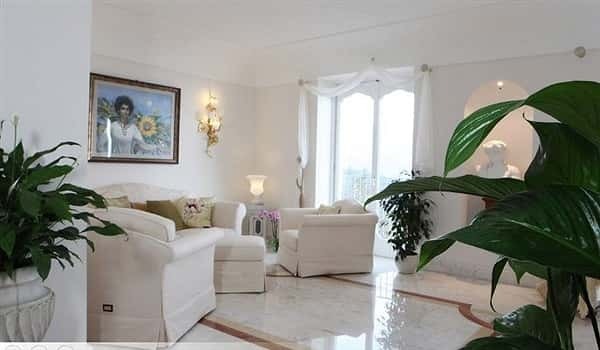 Now, after four years of restoration and modernization, tenacity and vision of the heirs of Mr Fraulo, the Villa has returned to its previous dignity and charm, adding to Via San Giovanni del Toro and to the others most prestigious hotels in Ravello (Palazzo Sasso, Caruso and Palumbo), a new offert in the quality accommodation. To the international guests and the many regulars ones, who have found their Ithaca in Ravello, Villa Fraulo offers the opportunity of an unforgettable stay in a magical setting, which is a true expression of style, capable of producing incomparable charm. The whiteness of Carrara marble, the pale gray of the stucco, furniture, ceramics and tapestries, chosen with care and meticulous attention to detail, are just a backdrop to the twenty-seven rooms, including suites, deluxe, superior and standard, all spacious and bright, well-equipped with the amenities required by five star hotels (wi fi system, wardrobe, air conditioning, room service 24 hours a day, mini bar, limousine service). Not to mention the spa with sauna, the heated pool, the experience shower, turkish bath and massage room, all born to pamper its guests and the infinity pool, facing the gulf. Outdoor and with heated water, it creates the illusion of embracing the sea, giving the feeling of swimming suspended between sky and water. Moreover. You'll find the lounges, elegant and comfortable, together with the large lobby bar and a really charming restaurant. Here, after a long work of restoration, a monumental fireplace, dating back to 1200, has come to light. Try the breakfast, served in the conservatory next to the bars, which is curated by the inspiration of the master confectioner Tiziano Mita, one of the best in the national scene, and be spoiler by the restaurant, which will propose refined light lunches, exclusive recipes, perfect reinterpretations of the classic Mediterranean tradition, coupled with the best wines regional and Italian. All at a reasonable price, really competitive, that the only incomparable views of the Gulf appears to be true.